Grateful for Little Things - George Lindemann Jr.
Last week I had the privilege of seeing AND filming a Northern Bobwhite (aka quail) at Coal Creek Farm in Eastern Tennessee. Sightings of these once ubiquitous little birds are rare. Having one slow down enough to film it is even rarer. The Northern Bobwhite (quail) has declined 85% in population over the last fifty years. This loss is largely attributed to the loss of its native habitat. Bobwhites historically lived in native grasslands, as well as in meadows and the edges of woods. These birds are ground feeders. They eat seeds, berries and occasionally insects. They are capable of short bursts of flight, but prefer to hide in clumps of dense grass. When the areas surrounding these clumps feel safe from predators the little birds will run out of their hiding places, peck off the ground and quickly hide again. Their only defense from other animals is their ability to hide and their ability to swiftly procreate. Native grass clumps have been replaced by millions of acres of fescue grass fields. While fescue grasses are hardy and grow much of the year, they create a carpet like environment. 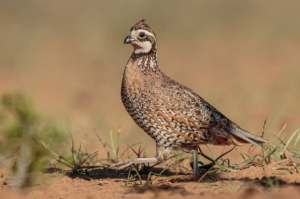 Small in stature, the Bobwhite cannot navigate through these millions of acres of carpet. The “new and improved” grasses, which have been planted throughout the southeast, have turned the Bobwhite into what Dr. Andi Vanderyaght (formerly of University of Tennessee) refers to as “nature’s walking Chicken McNuggets®.” The birds no longer have a place to hide. They can no longer defend themselves. And they can’t reproduce in great numbers as they have historically done. The Northern Bobwhite population continues its decline towards eventual extinction. At Coal Creek we have been working with University of Tennessee and other institutions to economically recreate native habitats, while maintaining an active cattle operation. Through the use of prescribed burns and cattle grazing, we hope to create a model where traditional for profit farming AND conservation can coexist. Catching the little bird on film was truly a treat. It is easy to be grateful for little things, when seeing and filming this threatened bird. The encounter makes me even more committed to the work we are doing at Coal Creek and I am hopeful for more encounters like this in the future.